The American Legion, Department of Florida is currently accepting monetary donations. Please know that 100% of your contributions will be utilized to support Florida veterans dealing with the widespread destruction. Your efforts are truly appreciated by those in need and those supporting the needs. We ask that all of our post in and surrounding the affected areas, please keep us informed, to the best of your ability. If your post is acting as a shelter or distribution center, we want to know. Please contact PDC Steve Shuga, 407-394-5534, for all logistical Hurricane Aid. The American Legion Auxiliary is also collecting items, this month for Hurricane Relief Aid. If you have items listed in the flyer below, that you would like to donate, please contact Auxiliary Secretary Patty MacDonald at 407-451-0410 or secretary@alafl.org, to make arrangements. Download flyer. Click here for update on relief efforts 10/25/2018. PHASE II Hurricane Relief Aid: Click here for update on relief efforts 11/8/2018. Thank you for your service, together we will make a difference. Eligibility open to Legionnaires and Sons of The American Legion members (up to $3,000) Legion Posts (up to $10,000). Applicant must have been displaced from their primary residence due damage sustained during a declared natural disaster. Not meant to replace or repair items, only to meet most immediate needs (i.e., temporary housing, food, water, clothing, diapers, etc.) during the period immediately following the disaster. Does not cover insurance compensation or monetary losses from a business, structures on your property (barns, tool sheds, etc.,) equipment or vehicles. Application must be submitted to the Department Headquarters within 90 days of disaster. Disaster must be a “declared” natural disaster for Legion Family members. Supporting data (photos, receipts, repair estimates, etc.) should be included if at all possible or statements (testimony) from post/district/department officers attesting to damages to residence requiring displacement. Only one grant per household per disaster. Post grants must derive from a declared natural disaster and substantiating documentation must provide that The American Legion post will cease to perform the duties and activities in the community due to losses sustained. INDIVIDUAL GRANTS: Grants from this fund provide immediate, emergency assistance to American Legion members, Sons of The American Legion members, active duty military and our veterans in areas devastated by a declared national disaster. Membership in The American Legion is NOT required to receive assistance. (Active Duty / Veterans must meet membership eligibility requirements and classified as having an honorable discharge or honorable separation) Non-Members must submit their DD 214. Eligible applicants are reimbursed for disaster related costs. These funds are not designed for insurance compensation or to cover monetary losses from a business, structures on your property (barns, tool sheds), equipment or vehicles. Only one grant per household (up to $1,500) will be approved. REQUIRED APPLICATION INFORMATION: Department Headquarters must have sufficient, documented information to justify the need. The application must be filled out completely and accurately. If needed, attach additional sheet(s) for supporting data (DD 214, photos, receipts for temporary lodging and food, work estimates, etc.). NOTE: Grant requests must be submitted to Department Headquarters by January 31, 2018. POST GRANTS: Grants from this fund provide immediate, emergency assistance to American Legion Posts in areas devastated by Hurricanes. Eligible Posts can be reimbursed for disaster related costs. These funds are not designed for insurance compensation or to cover monetary losses from a business, structures on your property (barns, tool sheds), equipment or vehicles. Only one grant per Post (up to $3,000) will be approved. The Disaster Relief Committee has the authority to alter these guidelines as they deem necessary and provided a standard is applied for every eligible post. REQUIRED APPLICATION INFORMATION: Department Headquarters must have sufficient, documented information to justify the need. The application must be filled out completely and accurately. If needed, attach additional sheet(s) for supporting data (DD 214, photos, receipts for temporary lodging and food, work estimates, etc.). NOTE: Grant requests must be submitted to Department Headquarters within 90 days of declared disaster. Awardees MAY be considered for both National Emergency Fund and Florida’s Hurricane Relief Fund at the discretion of the committee. Applicants must show income sustainability. In order to apply for funding, an Emergency Assistance Request must be submitted (all information provided in the request will be considered confidential.) Estimated time to complete the application, considering that information is easily accessible, is only about 30 minutes. The form can be filled out online or it may be downloaded for email submission. The Auxiliary Emergency Fund is available to active members. You must login to your account to access the application. 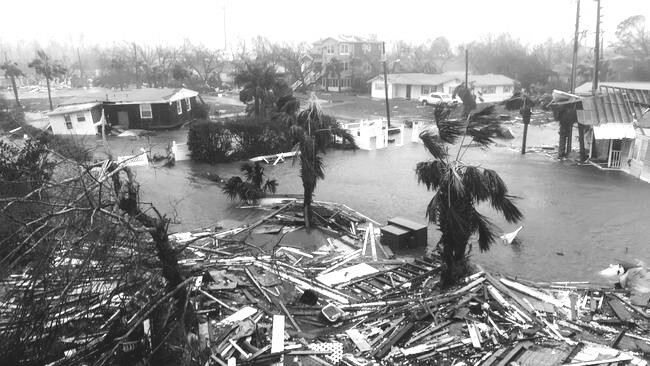 A full 100 percent of donations to the National Emergency Fund are turned into grants for individuals, families and post impacted by natural disasters. Donations are not used to cover administrative or promotional costs. Assistance through the National Emergency Fund is available to Legionnaires, Sons of The American Legion members and Legion Posts. For more information Call 1-800-433-3318. The Department of Florida will be collecting monetary donations only at the present time. Checks payable to The American Legion, Department of Florida, note “Hurricane Relief” in the memo. PROJECT: VetRelief is a 501(c)(3) program of The American Legion, Department of Florida, which provides one-time financial relief to qualified applicants for cost of necessities, such as: food, shelter, utilities, some emergency medical needs, emergency transportation needs. This program does not specifically provide disaster relief, but can assist, mentioned above, for basic necessities due to setbacks from disaster related events. Make checks payable to PROJECT: VetRelief . The American Legion Auxiliary also has an emergency fund. If you would like to volunteer, if your Post would like to serve as a distribution point, or you need supplies in your area, please contact Commander Shuga, commander@floridalegion.org, for additional information.